Why Picture Books, Why Now? If you follow me at Facebook, you probably know that, these days, my writing focus is on several picture books I’m revising. For someone who’s first book was middle-grade, who spent a couple of years working on a YA, and who has another middle-grade first draft waiting in the wings, this is a bit of a surprise. At least to me. I’ve always loved picture books. 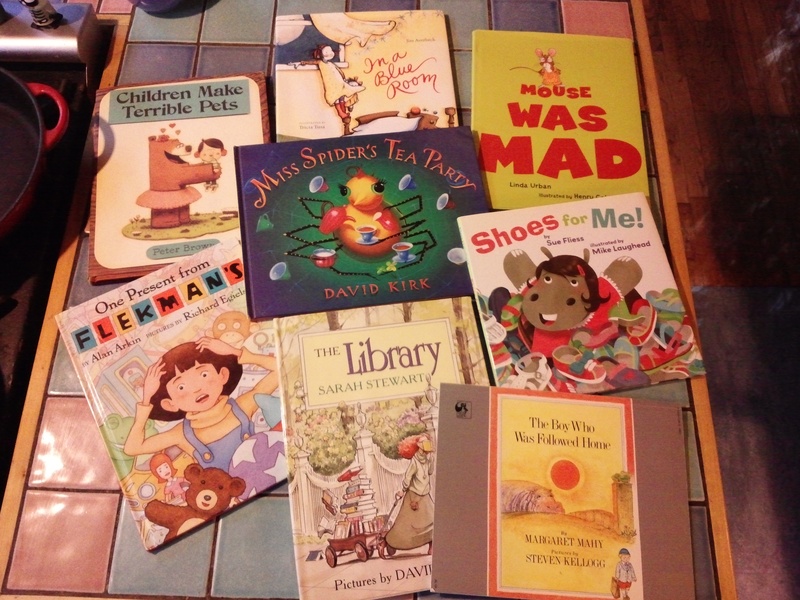 Well, let’s say I’ve always loved a few, very-special-to-me picture books. Some came along from my childhood. Others I collected in more recent years of being a mom and a writer. But it was not a genre I ever expected to be writing in. 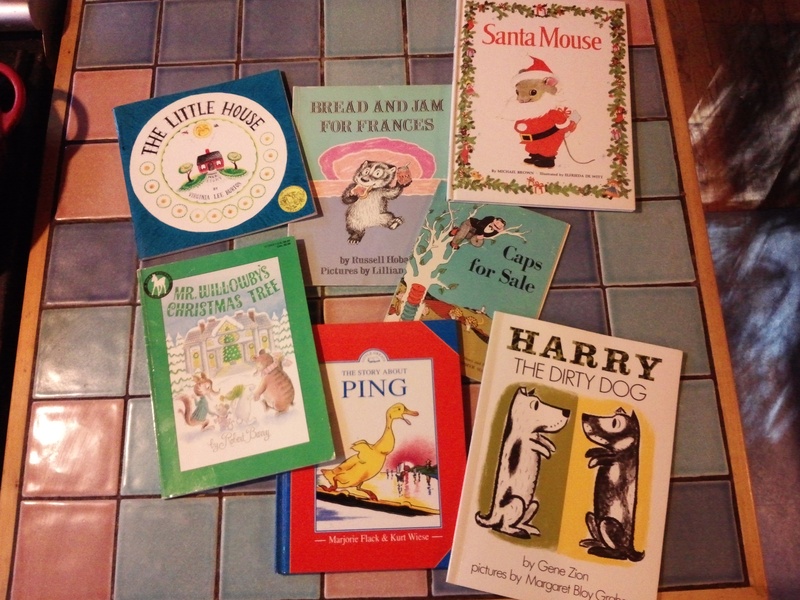 When my son was little, yes, we loved picture books. We read STACKS of them. At the same time, though, I was–as a reader–eager to get to the books we could spend a little more time with. Jen Robinson recently posted about her daughter wanting Jen to read Little House in the Big Woods to her, and Jen asked about the first chapter books we shared with our children. Those were magic read-aloud years for me and, I think, for my son. From My Father’s Dragon to Lionboy the whole Harry Potter series, those were the years of long, pre-bedtime reading sessions, starting when my son was small enough to tuck himself up under my arm while I read to his being stretched out across most of the couch, leaving one cushion for me and the book. For Harry Potter, my husband took another chair in the room and listened, too. And then…I wrote The Writing & Critique Group Survival Guide. For each section, including the one on critiquing picture books, I wrote some made-up text, “sample” passages, to demonstrate what to look for in a critique and how to present feedback. While I was working on the picture book “sample,” I had an idea. I had an idea I liked. I decided I didn’t want to “give it away” to the critique book. And so I made myself a promise. I promised myself that, if I left the idea out of the critique book, I would take that idea and write it into a picture book. And I would take that picture book through all the drafts it took to be “ready,” ready at least to submit. I kept that promise. I’ve had good feedback on the manuscript, enough to know that, yes, I can write in this genre. And another thing happened. I fell in love with this genre. Well, in all honesty, a big piece of this is the length. I went back to work part-time a couple of years ago, and while you will never hear me say that writing a picture book is easier than another kind of book, because it isn’t!, it is easier to fit the work into my life these days. Yes, I can do a revision in a weekend. I’m not saying it’s the revision, and I’m not saying there aren’t a lot of weekend revisions for each book, but I just can’t do that with a novel. When you’re feeling a bit discouraged about your writing pace and how well you’re juggling the work hours and the writing hours, there is something encouraging about seeing actual, concrete progress. But there are other reasons. I love the way a single sentence, a single word, can be both the problem and the solution. I love (and, yes, hate) the challenge of creating an active, problem-solving protagonist who, as a child, has such limited options for taking charge and having an impact. I love having to write words that will sound right, not just read right. I think, with picture books, I have discovered why I lean toward writing the “younger” books. Yes, as an adult, even a not-so-young adult, I still feel all that magic in books. And, yes, I know plenty of teens who feel it. But, maybe, just maybe, the magic is at its strongest for younger children. And maybe I can be part of creating it. Beth, I think there is still a new magic in middle-grade. They’re just so different from pbs or even beginning chapter books, and the audience I see then is also curled up on the couch, possibly alone, possibly with someone else at the other end of the couch, but totally immerse, just GONE, oblivious to any thing else that’s going on. Also a wonderful vision to have as I write. Not sure why I can’t summon up a comparable audience/sight for young-adult, but it’s not there now/yet for me. That is really neat, Becky. I especially like your description of the someone, too. Of course it helps that I can picture my own someone, curled up reading picture books. I’ve learned that one of my very favorite moments of any day is when my daughter laughs aloud at something that we run across in a picture book. That’s when I know that the team that is the author, the illustrator, and me, we’ve all done something right. BTW we are still picking up Little House in the Big Woods at intervals, but she mostly wants to know what the stories are behind the pictures. I look forward to the day, whenever it comes, that she can start making her own pictures in her head. But we have plenty of picture books in the meantime… I can totally see why you’ve fallen in love with them.